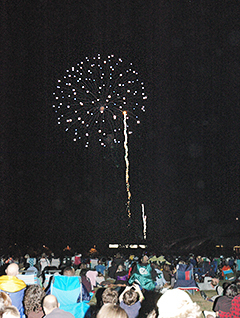 SPIRIT IN THE SKY: The Independence Day celebration hosted by the Spirit of Princeton lit up the sky above the Princeton University athletic fields last week. In a nutshell, this is a once or twice per decade heat wave, said New Jersey State Climatologist David A. Robinson. Temperatures have reached 100 degrees at some locations, and have been well into the 90s at most other locations around New Jersey since Sunday. The heat is expected to continue at least through Thursday, though Tuesday was expected to be the hottest day of all. The remaining hurdle for the recently-approved Princeton International Academy Charter School (PIACS) will be addressed on Wednesday evening, July 7, when the Plainsboro Zoning board will be asked to okay the schools request for a use variance so that it can occupy the St. Joseph Seminary premises at 75 Mapleton Road. The groundbreaking on the Mountain Lakes Dam Rehabilitation project and dredging of the upper and lower lakes commenced on Tuesday at Mountain Lakes House. Engineer and Township Project Manager Deanna Stockton said that the $3 million contract requires the project to be complete by October 2011. Congressional hopeful Scott Sipprelle introduced his television advertisement with a press conference last Thursday at his Alexander Road campaign headquarters. Running for the House of Representatives seat in the 12th District as a Republican, Mr. Sipprelle is challenging incumbent Rush Holt. Construction on the new Merwick Care and Rehabilitation Center  located in Plainsboro across the street from the new University Medical Center campus on Plainsboro Road  is ahead of schedule, with the facility slated to open in September. It looked like Dan Barnes dream to play pro baseball might be shattered during his sophomore season with the Princeton University baseball team. Fighting to Eliminate Hunger Is the Mission and Ministry of Charles P. (Chuck) Inman, Jr.
Charles P. (Chuck) Inman, Jr. would surely agree with this thought from Helen Keller. His unswerving dedication and commitment has been a potent force throughout his life.